Ready for the BASICS of being politically effective? Then this book is for you! 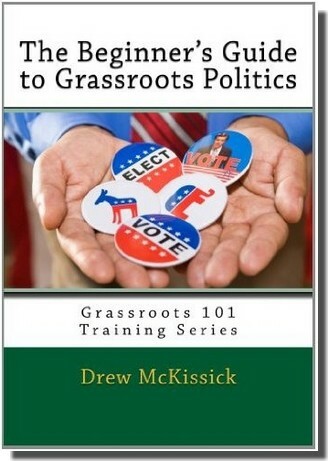 The Beginner’s Guide to Grassroots Politics is Level One of the Grassroots 101Training Series, and it’s the “how to” manual for having an impact on our political system. The purpose is to break down the complexities of the political system and give a basic understanding of the fundamental techniques that can help you have an impact. The two things that truly determine how politically effective individuals can be are their knowledge of the system and their willingness to participate. The purpose of the Grassroots Training Series is to equip you with all the knowledge you’ll need to have an impact on the things you care about. Remember, you don’t have to be a politician in order to make a difference. You just have to be willing to participate and then let your voice be heard. The Grassroots Training Series gives you the tools. Why organize at the grassroots? How to organize for success? Get your copy and start being more effective for the things you care about! Order now for just $17.95 from Amazon!